Sitting (left to right): 1. Phil Johnson, 2. Mike Agar, 3. Susan Dopking. Standing: 1. Sue Reginato, 2. Dan Spruill, 3. Anne Carr, 4. Pat Brosnan, 5. Christy Wooster, 6. Barbara Mingoia, 7. Mary Beach, 8. Tom McLoughlin. The kids in the picture are members of the high school graduation class of 1963. To find other pictures of the class of 1963 in the archive, see Livermore class pictures listed by year of high school graduation: 1963. 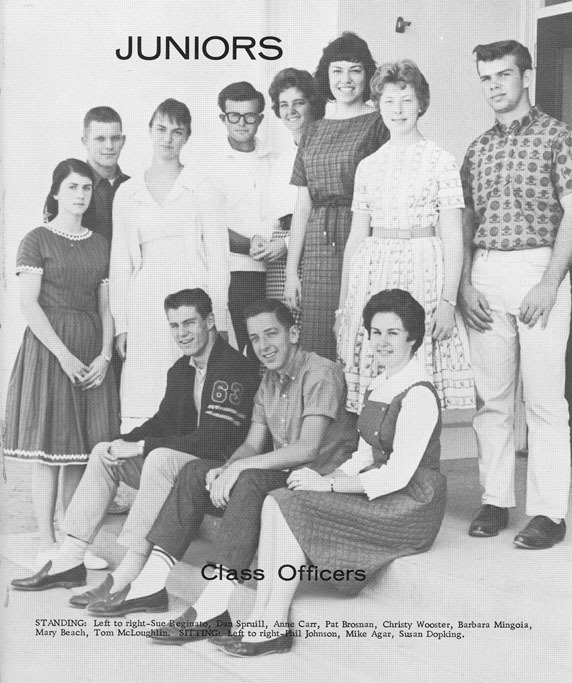 And if you have any pictures of the class of 1963 that you would like to share, please submit them to the Archive.